“I am only one; but I am still one. I cannot do everything, but still I can do something. I will not refuse to do the something I can do”–Helen Keller. “Excellence is not an act, but a habit”–Aristotle. “Most men die from the neck up at age 25 because they stop dreaming”–Ben Franklin. “I’m learning that almost any success in bigger things takes years of commitment in small things. Slow and steady usually wins the race. Legacies aren’t built in a day but in small, steady steps. Faithfulness counts. 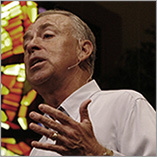 Faithfulness matters in marriages, jobs, parenting, friendship and kingdom endeavors”–Michael Sprague. “To be sure, Christians are called to be conscientious citizens and generally speaking, to submit to human authorities. But if the authority concerned misuses its God-given power to command what he forbids or forbids what he commands, then the Christian’s duty is to disobey the human authority in order to obey God’s. . . . God’s people are under obligation to obey him, and if they do so, even though they may suffer when they have to disobey human authorities, they will be richly rewarded by the ministry of the Holy Spirit”–John Stott. Would you like to receive all of my posts? You can receive your free copy in your inbox each morning by signing up below.